UAF owes an enormous debt of gratitude to its highly committed board of directors. These individuals, who give so generously of their time and money, also share their invaluable resources, skills and talents with UAF. Joellyn is a dedicated animal rescuer who has volunteered full time with United Animal Friends since 2005 and has served on the Board of Directors since 2008. She is a hands-on person and works in all aspects of the organization including marketing and fundraising, evaluating intake animals, matching foster parents and foster dogs, facilitating adoptions, mentoring volunteers and coordinating social media. At present, Joellyn shares her home with her seven dogs and very supportive husband Roger. Doug is a semi-retired lawyer who now has time to devote to United Animal Friends. He joined the board in 2018 to pursue his passion for helping dogs find safe and loving homes. Doug, his wife, Laura, and their own rescues (Jaeger and Elwood) have fostered many UAF dogs over the last few years. Doug is excited for the opportunity to leverage his legal, business and leadership experience to help UAF enrich the lives of as many dogs and owners as possible. 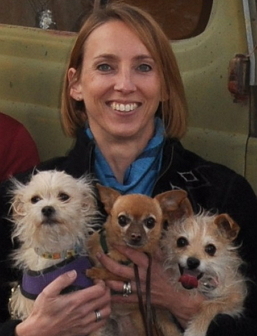 After being an airline pilot for 28 years, Stephanie was able to retire and pursue her passion of dogs and rescue. She served on the board of directors at the Central Arizona Humane Society in Payson prior to moving to Prescott, where she volunteers with United Animal Friends, Luv Mutts Therapy Dogs, and Good Samaritan Hospice. Stephanie and her husband share their home with their registered therapy Dachshunds, two Great Pyrenees, several goats, and the many dogs and puppies they foster. Mary volunteered with the Atlanta Humane Society taking puppies to nursing homes prior to moving to Prescott. She began volunteering for United Animal Friends as a handler at adoption events, and since then she has gotten involved in other aspects of UAF - fostering, washing dogs, working at the rummage sale, writing grants, etc. Mary has had a varied career as an attorney, non-profit executive director, and technical writer. She and her husband, John, have two beloved fur babies - Sidney (Lab/Chow mix), a stray who came to their door one night, and Zara (Bearded Collie/Scottish Deerhound mix), their UAF foster that they adopted. Suzy joined United Animal Friends in 2011 when she was looking for a kitten. She found her kitten hanging on the cage with her mother and siblings behind her; however, she needed a foster so Suzy started fostering that day. Suzy is now UAF's Cat Coordinator and fosters very ill and hospice animals. She is passionate about assisting all animals and finding homes for them or helping them when they are ill and just need plain old TLC. Mike is the Owner-Operator of Run-A-Muk, Arizona's premier dog and cat pet resort located in Prescott. After graduating USC, he spent most of his adult life working in the hospitality business and serving on multiple non-profit committees including Children's Hospital of Orange County, Children's Hospital of Los Angeles and MDA, raising $1 million. Today, working with the incredible volunteers of UAF, his goal is to make a difference in the lives of animals who need a second chance. Jeanne has been involved in animal rescue for over 20 years as an independent rescuer and volunteer with A Forever Home Rescue Foundation, HART of Fairfax County, Hedgesville Hounds, All Pets Rescue, Capital Area Rescue Resource Transport, Yavapai Humane Society and United Animal Friends. She also volunteers with Prescott Hungry Kids Program and Animal Disaster Services. Jeanne says, “I am proud of the strides UAF has made in the Prescott community with respect to animal welfare education and rescue since its inception." Debbie first started in rescue by fostering in Michigan in 1989. Since then she has been in many roles, including volunteer President of the Humane Society of Livingston County and the Director of the Livingston County Animal Control and Shelter, both in Michigan. After a corporate career in sales, marketing and management, she and her husband semi-retired and moved to Prescott in 2015. Their home had always been full of dogs and cats - foster pets awaiting adoption and, of course, those fosters that became permanent family members. They currently have one dog and two cats. Laura is a partner in Zeman-Mullen & Ford, an intellectual property law firm. Laura actively takes on pro bono work in the area of children's rights and best interests, and was named Children's Law Center Advocate of the Year for the Volunteer Lawyers Program in 2009. She has been active in the Phoenix community for the past decade and a half including serving on a Foster Care Review Board for 7 years and serving on the Board of Directors for both A New Leaf and the Arizona Friends of Foster Children Foundation. As a part-time resident of Prescott, Laura is now devoting her volunteer efforts to helping animals through United Animal Friends, where she has been a board member since 2014. 1. Annually review the organization’s mission and vision. 2. Oversee and monitor operation of the organization. 3. Create, document, and review policies and procedures. a. Review results compared with the organization’s annual and long-range goals. 5. Ensure adequate financial resources. a. Approve an annual budget. 6. Protect assets and provide proper financial oversight. 7. Ensure legal and ethical integrity. a. Complete and abide by conflicts of interest and disclosure policies. 8. Support the organization in terms of time, talents and finances. a. Actively participate in board meetings, committees, retreats/training, events and fundraisers. b. Establish annual goals and objectives for the board. c. Participate in the review of board performance and assist in determining steps to improve. d. Propose prospective directors to members so vacancies can be filled as needed. e. Provide candid and constructive criticism advice and comments. 10. Enhance the organization’s public standing. 11. Review and approve all major contracts and grant proposals.